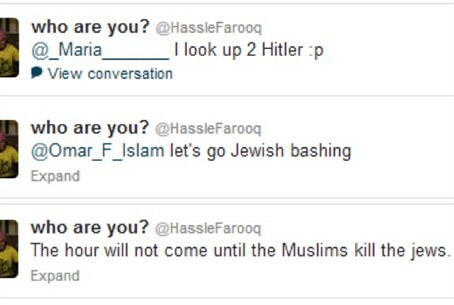 Why was Hassan Farooq, who promotes 'Jew bashing', asked to front last year's official Holocaust Memorial ceremony? An interfaith group which works to combat political and religious extremism in the UK has raised awkward questions about the way anti-Semites "use" holocaust memorials to "sanitize" their own images, even as they actively engage in anti-Jewish bigotry. On Holocaust Memorial Day in 2013, a young British Muslim named Hassan Farouq was a participant in the official Holocaust Memorial Day ceremony at London's City Hall. During the ceremony he read out a text about the importance of reflecting upon the consequences of the Holocaust and remembering the victims of Nazi persecution. Yet Stand for Peace today released clear evidence of Farooq's own rabid anti-Semitic views, including open glorification of Nazism and Adolf Hitler, and questions whether London officials who approved his participation in the ceremony ascribe any value to Holocaust Memorial Day at all. 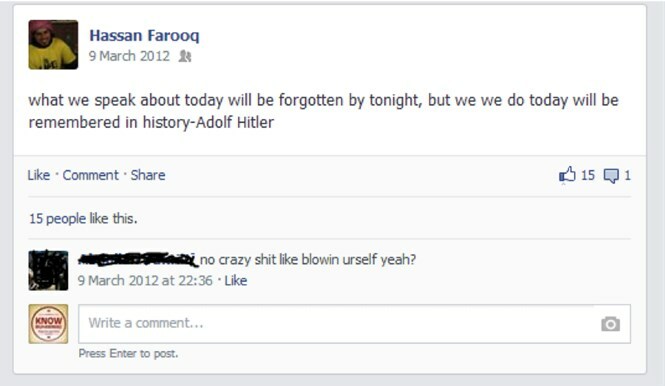 "I look up to Hitler"
Apart from anti-Semitic tweets, Farooq has also expressed his extremist views on Facebook, including a passionate defense of the infamous Woolwich terrorists who murdered off-duty British soldier Lee Rigby. In another message on Twitter, he defended extremist preacher Anjem Choudary, who was recently implicated as being a key player behind an Islamist network actively recruiting young British Muslims to fight in Syria. Farooq also posted messages against women and homosexuals. According to Stand for Peace, Hassan Farooq is a “senior member” of the Newham Dawah Team, an East London-based Islamic missionary organization which attempts to spread the message of Islam. In 2009 students at NewVic Sixth Form College, which Farooq attended, released a video featuring calls in Arabic for a "war against the Jews". Newham Dawah Team is part of the Islamic Education and Research Academy (iERA) Network, and its officials regularly liaise with iERA officials such as Abdurraheem Green. The iERA is an extremist Salafi group, some of whose officials have been banned from the UK. In the past - despite his apparent work with various "interfaith" initiatives - Abdurraheem Green has been quoted as talking of a Jewish “stench” and advocates the killing of homosexuals. Sam Westrop, Director of Stand for Peace, questioned how "such a solemn and important duty can be entrusted to a vile extremist who does not even try to hide his hatred for Jews, women and homosexuals?" and suggested that the apparently puzzling contradiction in Farooq's action is actually nothing new. "Once again, anti-Semitic activists are attempting to exploit the commemoration of the Holocaust to sanitize their public image," he explained,but added that "the facade is a thin one." Westrop questioned the commitment of the event's organizers, given that Farooq apparently made little effort to hide his anti-Semitism. Stand for Peace recently published a comprehensive document detailing how Islamist groups with openly bigoted agendas and support for terrorism are similarly whitewashing their images by "monopolizing" interfaith efforts, and using the opportunity to sideline moderate voices within the Muslim community.